Paper Planes: Jealousy: A Hungry Emotion or a Signpost? Jealousy, an emotion that has troubled innumerable brains, broke countless hearts and caused unrest to numerous souls, in various ways. Let me go back to my childhood and narrate a small incident which will make it easy for me to explain the whole thing further. Ok, so I have this cousin of mine with whom I am very close, very close since the days I remember. I am certainly not here to tell the happy and glorious cousin tales, but then to narrate a weird obnoxious thing behind those happy moments. You know she used to live in a metro city and I belonged to a small town. And so, there were differences between us, quite a few notable ones. She used to wear beautiful dresses, had such beautiful wavy shiny hair, she had many barbies, trust me many! And on top of that, she had different dresses and accessories as well, for them. And to my dismay, she scored higher than me even in studies. So, in gist, I used to feel terrible and horrible and inferior and whatever negative adjectives you can think about, can be made to fit in this puzzle. But I would like to mention here that despite whatever, I never stopped loving her. Then, now and will always do! But you know when did this thing crossed the limit? Well, a day which was gloomy and depressing for me. I was in pain because of all this, so much so that it made me hatch a plan - a devious one. I was up a little late in the night and waited for everyone else to sleep. And once sure of that, I just went off to my cousin's bag, picked up her fav barbie (and off course, the most beautiful one) and broke it into parts and threw it off at the back of our house (with all her accessories) which was nothing but a field of wild plants. And trust me, I felt so contented at that time and regret it today! I don't understand that particular emotion, that thing, that strong thing that made a little girl do such a heinous thing? Jealousy! And this is one emotion I was and is so much scared of. Jealousy can make you do things that you cannot even think about doing normally. It takes you into some other zone, where you are not yourself, you are just unable to think, as if somebody has switched off the button of your sanity. 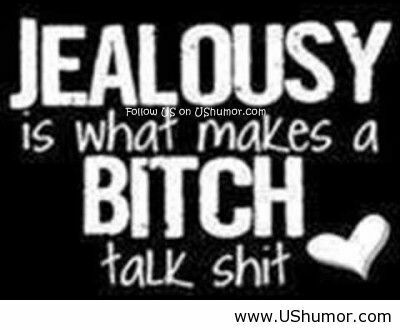 That's what jealousy does to you, it gives you pain and you pay the price of your sanity for it... And why do we do that? Because we become helpless. It just happens without you knowing or even realizing. In fact I very strongly believe that when you are jealous, you make up stories, all kind of unreal stories in your mind and torture yourself. You strive and crave to know more about that person, about that thing that you feel jealous about. You start craving for the content. I don't know why? It hurts you, it gives you pain, but you like a fool still go back and search for more such stuff. You are just unable to leave it and live in peace!!! Isn't it? You know why? Because jealousy is a hungry emotion. An emotion that needs to be fed, fed with imaginative and unreal stories, if there are no real ones. Take example of social networks, whenever your friends put up check-ins in some exotic places, you almost stop breathing, that surge of pain is much more than anything. And don't lie girls, whenever you see those pictures of other girls with flawless skin, beautiful hair and eyes, on insta, you start pondering about why you dont have it all. A small tip here: invest in some expensive makeup kit and you will have it. Anyways, yes so guess that's the reason why social networks are so successful (of course, apart from other amazing reasons). They feed people with content! And we like fools, go back and feed on the same content and go through the torture! Why don't we just stop feeding this monster? And if we do so, it will eventually die and you will never have to pay the price of your sanity for it after that. And trust me, you will live happily! Or think it from the other angle, I sometimes even believe that you generally feel jealous of stuff that you think you can achieve or get, but do not have. We tend to envy things that are actually within our grasp like in above eg a barbie doll or good marks or that attention of my parents or relatives. Now let's give this poor emotion a bit of positivity. Jealousy could be a signal for anybody to put in more effort into things that you envy about others: like a relationship, or appearance, or a job or whatever. Jealousy is a signpost. Period! We are jealous of attributes that are attainable to us. So, next time you feel jealous, stop feeding the emotion and start working on the things that makes you feel jealous because trust me, they are the ones that are obtainable and that's why they bother you. PPS. Yep! I never had the audacity to ask my dad for a barbie. Flattery can be demanded but jealously has to be earned. Beautifully articulated. A variety of online slot games. บาคาร่า It is a website where you can join the roulette games, internet network. Many other gambling games are also available on the websites that provide gaming services. Whether it is an Internet casino. Sports Betting Online bookmaking and more with the expertise and expertise in providing services to all buyers with more than 12 years. Our website is well known in the field of online risk across Southeast Asia. The Internet Roulette is a play and random number for the spin wheel. There are 37 numbers appearing on the dial from number 0 to 36 with 18 red numbers, 18 numbers and 1 green number. These numbers are the numbers. Gambling Down Betting on multiple channels And unless there is a slot game, we also have more than 500 betting games to choose from.